One of the best secrets of frequent travelers is knowing the best seats on every kind of plane when you buy your ticket. Each different kind of plane on each different airline have good and bad seats and usually you don't figure out which one you have until you get on the plane. Amazingly, if you pick the right seat, you can end up with extra legroom and a wider seat then the people in front of you. 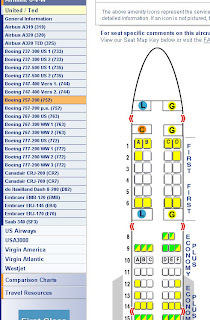 Of course you cannot memorize the best seat on every plane, but fortunately there is a great tool online to find the best seat www.seatguru.com . They list every airline and every plane giving you a map of the best seat on each. Red seats are the ones you want nothing to do with, green are the ones you want to snag and yellow...well those are a last resort. Another hint though, allot of the good seats are blocked out for frequent travelers so if you plan on traveling a lot during the year try and stay with one airline to make their elite program so you can grab them. I'm gonna get back to this entry of yours once we plan to travel. thanks for the info. cool... thanks for the tip!